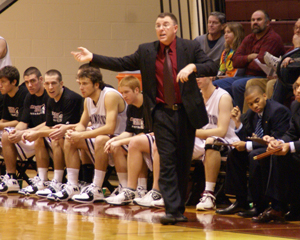 Two years ago Washington College Basketball Coach, Rob Nugent, was honored for his display of compassion and character on the court. Nugent made national sports headlines when he instructed his players to foul Gettysburg senior Cory Weissman, who was paralyzed in a training accident, to give him a chance to score his only points in a varsity game. Weissman made the second of two free throws and received a standing ovation. The incident was cited widely as an example of the kind of sportsmanship lost in the “win-at-all-costs” atmosphere of modern sports. The inspirational tale has been made into a movie, “1,000 to 1: The Cory Weissman Story” in which Nugent plays himself. The movie premiere was this past weekend and the DVD will be available for purchase from Amazon.com starting tomorrow, February 4th, 2014. For more information on the movie, check out www.1000to1movie.com. Rob Nugent was the keynote speaker at the third Character Counts essay award ceremony. In a moving address to local students, who represented public and private schools from all parts of Kent County, Nugent engaged them in a lively question-and-answer session. His theme was “Me vs. We,” thinking unselfishly about the greater good as opposed to personal advantage. 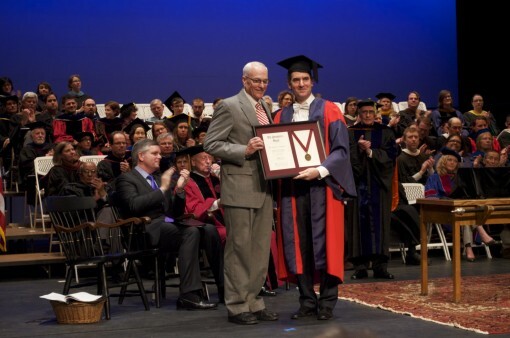 Washington College Honors Character Counts! Say “please” and “thank you”. Don’t interrupt. Share. Don’t cheat. Admit your mistakes. Greet people with a smile and a firm handshake. Such seemingly small lessons in good manners and citizenship can make a huge difference in a child’s future success. When the local Character Counts! program sends more than a hundred volunteer “character coaches” into Kent County classrooms each week, they help our community’s young people become better friends, better students, better neighbors. A bonus for the schools: The more the character coaches succeed in their mission, the more time their host teachers can devote to academics rather than to discipline and classroom order. A diverse lot with a variety of backgrounds and experiences to share, the coaches range from Washington College students to civic-minded retirees. Equipped with lesson plans, enthusiasm and a loving concern for children, they teach the program’s six pillars of character– Trustworthiness, Respect, Responsibility, Fairness, Caring and Citizenship. Just as importantly, they share their own life experiences and become role models for how to build a successful life. While the Character Counts! lesson plans may be tailored to audiences aged 5 to 15, these six pillars can serve as a framework for how all of us, ages 5 to 105, should treat each other. Trustworthiness, respect, responsibility, fairness, caring and citizenship? Yes, please! Thank you. 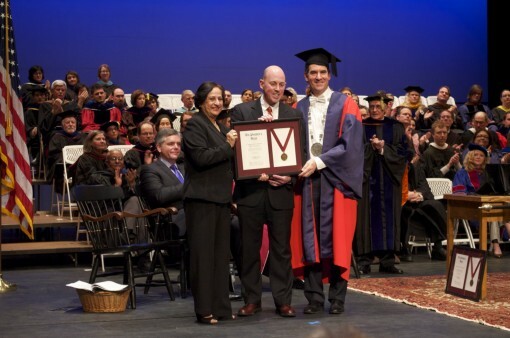 For their ongoing commitment to teaching the essentials of good character and for serving as role models for the young people of our community, Washington College is pleased to present a President’s Medal– our version of a Gold Star– to the volunteer coaches of Character Counts! of Kent County. 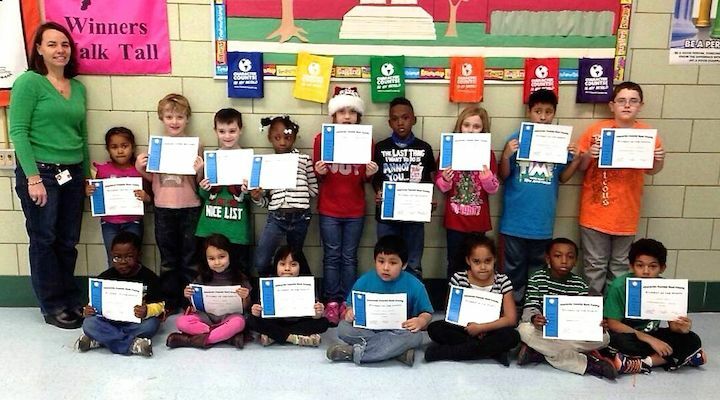 Each month, Garnett Elementary School recognizes students who exemplify the six pillars of outstanding character. The pillar for the month of December was “caring.” Students of the month receive a certificate from the principal and a coupon for a free pizza from sponsor Pizza Hut. The Kent County News covered a spectacular display of support for Kent County’s Public Schools by local business Dixon Valve. “At the school board meeting on Monday, January 13th, Dixon Valve made a donation of $48,687 – the balance of what was needed to purchase math books for third, fourth and fifth graders. In its fiscal year 2014 budget, the Kent County Board of Education allocated $250,000 for math and reading textbooks for elementary school students.” According to Dr. Couch, Kent has not been in the position to purchase new textbooks in 15 to 20 years. The check was presented to Superintendent Karen Couch by Keira McColigan, a fourth-grader who attends Worton Elementary School. 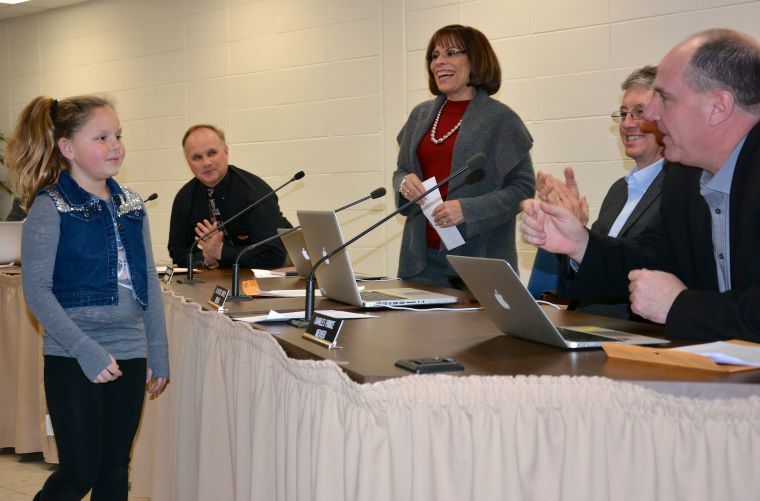 She was accompanied by her Father Jim, a Dixon employee and the President of Character Counts! Kent County. Dixon Valve and Chief Executive Officer, R.L. Goodall have been long term supporters of Kent County’s Public Schools. A total of 32 Dixon employees are Character Coaches, visiting a classroom every week – some coaches for many years now – for a short lesson in ethical values. According to the Kent County News, “Dixon Valve & Coupling Co. is the largest private supporter of Kent County schools – in terms of money and volunteers.” Thank you Dixon Valve for being a true business of Character, CC!KC is proud to of your immense support and involvement in our organization. To read the full article from The Kent County News, click here. At the beginning of each month a group of selected students are recognized as the Character Counts! Kent County Students of the Month. The Student of the Month initiative is supported by our local Pizza Hut, who provides pizza coupons for each recognized student throughout the year. Character Counts! Kent County recognizes Pizza Hut as a proud supporter of Kent County Students and their Character achievements. 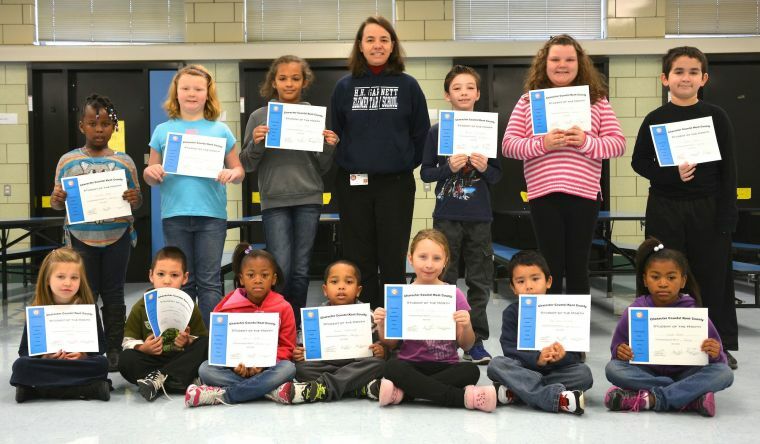 Garnett Elementary’s Students of the Month have been featured in the Kent County News each month this school year. Students who best exemplify the Character Counts! pillar of responsibility were selected as the September Students of the Month. One boy and one girl from each grade level, pre-k through five, were honored in the Kent County News for their Character achievements. 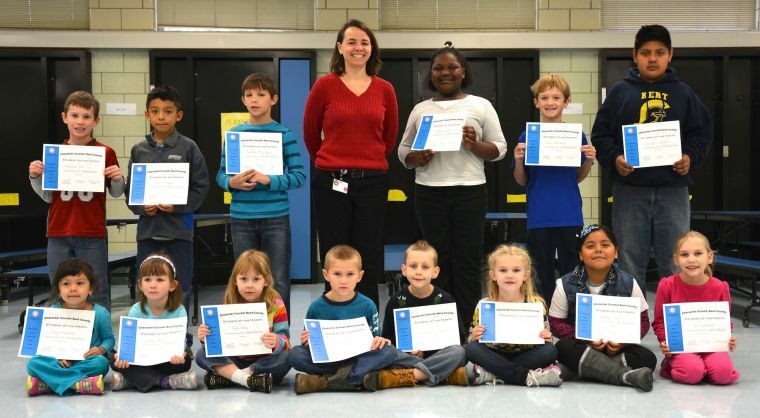 Garnett Elementary School’s Students of the Month for October and November were also featured in the Kent County News showing off the certificates of recognition they received from Principal Stacey Clark. 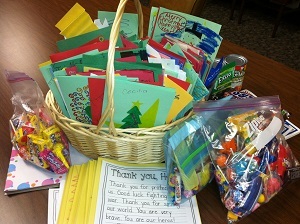 In the next couple weeks troops in Afghanistan will be receiving cards, candy and other goods from CC!KC students. As part of the November 11th Character Counts lesson “count your blessings”, students in many Elementary school classes worked with their Character Coaches to make cards and gather small gifts for our troops. Crystal Killen, a Character Coach and Dixon Valve employee, organized the creation of a special addition to help add a bit of holiday cheer to the regular care package she and other Dixon Valve employees send to their colleague, James Bianco, who is currently stationed in Afghanistan. In the next care package James receives he will find the pictured basket full of cards and well wishes from our Kent County students for him to enjoy and share with fellow troops. Thank you CC!KC students for helping to spread holiday cheer to those of us who won’t be able to make it home for the holidays. This time of year we are often reminded that the small things we do for others are the things that can make a big difference.